In May of 2009, Arturo Méndez visited Vancouver. He stood before shareholders of Goldcorp Inc and denounced the company for their refusal to obey community demands that they end their operation in Mayan territory. Three months later, Arturo Méndez lost his son. On September 7, 2009, after working in the corn fields all day, Walter Méndez Velásquez, 19, was killed by a bullet in his thorax. Velazquez lived in a small Mayan village named Colotenango, in the department of Huehuetenango. Before his assassination, he was interning with CEIBA, a community development organization, and learning agricultural skills. Colotenango is a town of primarily Mayan Mam families. It's also one of dozens of cities to have voted against open pit mining in a community referendum, also known as a Consulta. Méndez Velásquez's father Arturo Méndez is a high profile member of the community, known for his leadership and outspoken rejection of mining. According to CEIBA, Arturo Méndez received a letter threatening to kill a member of his family in 2008. 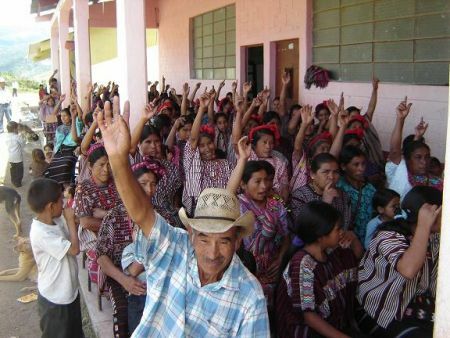 In a communiqué denouncing the death of Méndez Velásquez, a coalition of Mayan organizations specified that they "demand respect of the more than 25 popular referendums carried out in Indigenous communities, which makes clearest the rejection of open pit mining; and an end to the persecution of leaders who struggle for their legitimate human rights." At press time, police have not identified a suspect and there is no proven connection to Goldcorp.